A balanced life starts with a balanced meal. That’s right, today we are talking about how to eat the food we love while still maintaining a healthy lifestyle. Joining me today is one of my favorite guests from the past. Lindsay Young and I first met on Instagram, of all places, but her message just clicked with me. Not only are her images beautiful, but she posts everything with balance and grace in mind. 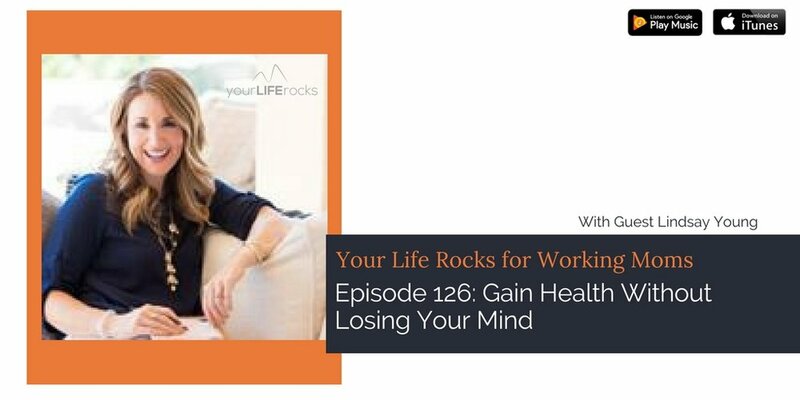 Lindsay is active in our Facebook and Your Life Rocks Membership group, and her philosophy on food and wellness fits so well with what we are all about at Your Life Rocks. I am excited to talk all about Lindsay’s Food Freedom Lifestyle with you today! First, a little more about Lindsay: Lindsay Young is a Certified Transformational Nutrition Coach and Certified Strength and Conditioning Specialist on a mission to help mamas like herself find wellness and freedom through food. Lindsay knows that we are busy, so we need a plan that is going to fit into real life. Eating healthy can be simple, beautiful, and easy. When Lindsay isn’t helping clients, she is living it up in Southern California with her husband and 3 kiddos. She is ready to embrace imperfection and pursue wellness, and I know I am incredibly fortunate to have her back on the show today. Lindsay and I are going to discuss what it actually means to live out the Food Freedom Lifestyle. It turns out that all it takes is a few simple mindset shifts to successfully create a healthy lifestyle. We, as Christians, are called to a high standard of living, but that high standard does not mean perfection. Instead of pursuing targeted health goals, Lindsay helps her clients change their overall approach to health and wellness. You are going to have a few easy, small steps that you can take towards an overall healthier lifestyle. In addition to her wellness philosophy, Lindsay will also share her thoughts on diet plans, the emotional impact of food, and how we can stand strong in spite of the messages the world sends us about our bodies. Food can easily become an idol, but luckily, knowledge is power! When we have both a head knowledge and a heart knowledge about what will be best for us, we can pursue this healthy lifestyle. Lindsay shared this scripture with us today that I feel encapsulates these ideals perfectly. Drink ½ your body weight in ounces every day. Avoid sugar, refined carbohydrates, and hydrogenated oils.